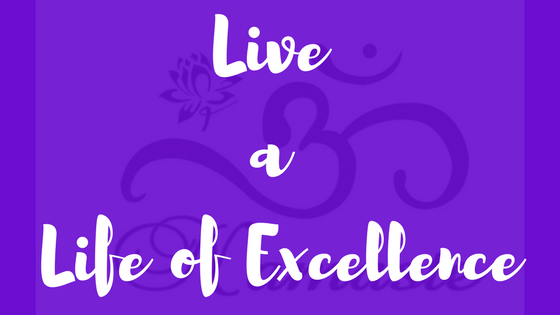 Do you want to live a life of excellence? I know I sure do. So how the heck do we live a life of excellence you ask? Well, here is a quote I found that pretty much sums it up. In other words, our habits define us. UH OH! Let’s stop and think about this. What kind of habits do we have in our life? Do we live with the thought that great things are going to happen and always looking forward to what comes next? Or do we live our lives wondering what’s next with dread and worry? Do we accept responsibility for everything in our lives and #OwnYourShit? Or do we play the blame game? In order to live a life of excellence we must always continue working on our P.I.E.S. (Physical, Intellectual, Emotional, Spiritual) for optimal health of Body, Mind and Spirit. W need to ask ourselves some of these questions in order to figure out where maybe we need to step up our game in order to live a life of excellence and have a lifestyle we love. Do we regularly take care of our body with good wholesome food, plenty of fresh air, exercise and good quality sleep? Or do we eat mostly of convenience food or maybe drink a bit excessively, sit more than move, spend inordinate amounts of time watching TV or on our electronic devices? Do we continue to try and keep our brains healthy by continuing our education in some shape form or fashion? Take courses or classes or read books on subjects that interest us, or help us move ahead in our business and keep our brains active? Or do we spend the majority of our downtime again, on the TV, or on electronic devices just scrolling or doing other mind numbing activities? Do we work on our emotional health with personal growth work by reading books, working with others and learning to communicate effectively in order to decrease the chance of telling ourselves stories in our head and either creating scenarios that could have or might have happened and learning to accept things for how they are while working towards something different? Or do we continue to just wish things were different or like they were before. Always wanting the quick fix without having to do all of work? Going from program to program or person to person, never quite finishing or maybe even beginning the process. Always having an excuse or looking for the “perfect” time to begin. Do we regularly pray or mediate or have some sort of ritual to help clear our mind and ease stress and anxiety so that we can have peace? Or are we continuously in our head always letting the mind take over and end up living more of a frenetic life? Each one of these things require habits. Both the good things and the bad. The type of habits we choose do cultivate will end up defining us. In my past I cultivated a lot of the bad habits in the italics. Over the past 5 years I have improved dramatically in each of these areas and yet I will continue to try and improve every day of my entire life. The journey will never end, because there is always somewhere new to go and something new that comes up that is worth working on. Wanting to help others find their life of excellence is one of the reasons I created my FREE Life Lessons mini course. 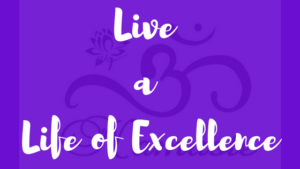 It is my 21 day introductory course to creating a lifestyle we love….in other words, a life of excellence. I understand that most people want a quick fix and don’t pay attention to habit change. I also know that it takes a MINIMUM of 21 days to create a habit and while it may seem like a long time at first, taking 3 weeks to master 1-3 habits is no time at all if it means being able to continue these habits forever. In this program we will take small actions daily to create momentum and build healthy habits that will last a lifetime. If you would like to begin the journey to living a life of excellence, then Register FREE here. When you have filled out the form you will automatically get a confirmation email. If you do not, then check your spam folder. If it is not there, then shoot me a message and I will manually add you. This program begins August 7-th and runs through August 27th.